Reissue of a legendary recording by a legendary ensemble: La Venexiana. 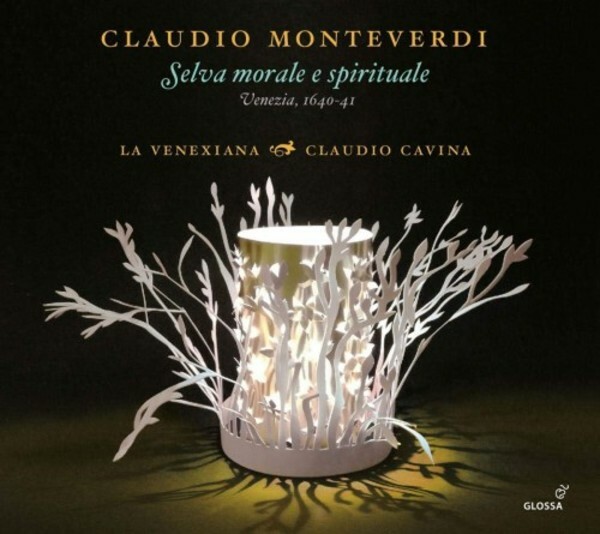 Recorded at the 2005 Semana de Música Religiosa Festival in Cuenca, Spain, the ensemble’s founding members (Rossana Bertini, Giuseppe Maletto, Sandro Naglia and Daniele Carnovich) are heard in the company of a select group of instrumentalists and singers, all of them under the direction of Claudio Cavina, for a memorable journey through the pieces contained in Claudio Monteverdi’s Selva morale e spirituale. Rather than following the order of the printed edition, La Venexiana have preferred here to arrange the sequence of pieces into three substantial liturgical settings, each one equipped with its own self-governing character. The first two discs contain one office of Vespers each, taking advantage of the fact that Monteverdi provided double (and sometimes even triple) versions of the Dixit Dominus, Confitebor, Beatus vir, Laudate pueri, Laudate Dominum, Magnificat and Salve Regina. The programme for the third disc has essentially been created around the Messa a 4 and includes other free-standing mass sections. The effect is of constructing a grand Missa solemnis, that perhaps might have been heard on 21 November 1631 in Saint Mark’s to celebrate the cessation of the plague epidemic in Venice.